Lovely graphics, expansive map and a good fusion of genres. Repetitive, clunky combat and long travel times. 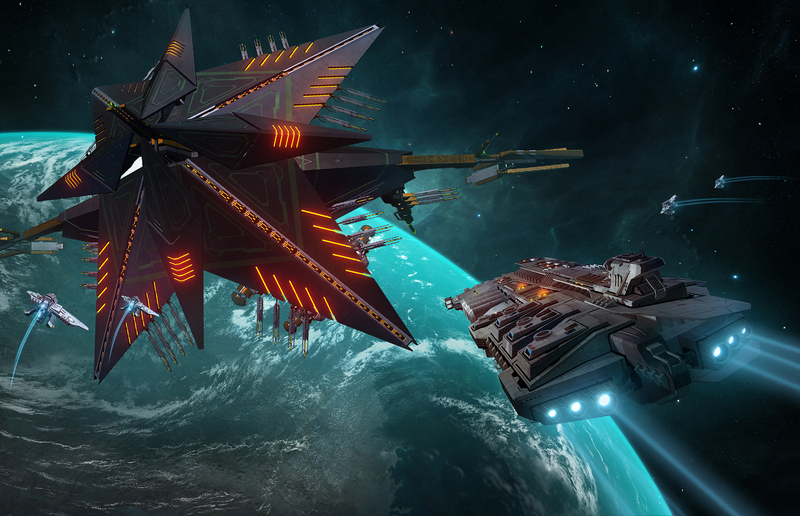 Starpoint Gemini Warlords is a very fun mix of a third-person space battle game and a 4X strategy game, blending the genres seamlessly. The game is hampered by repetitive side tasks and the (admittedly realistic) long travel times between areas. Considering the amount of gameplay available and the sheer length of campaigns and situations in Starpoint Gemini Warlords, $35 is a very reasonable price to ask. To be perfectly honest, the story is not something I paid much attention to. In the Solari Concord campaign, the story is more or less critical to progressing, until your character assumes control of the massive space station Concordia and the 4X elements are properly incorporated, at which point I was able to ignore the story with no pressure or consequence. The story itself is not bad, but not captivating, and can cause conflict with player actions. Once I was put in charge of the Concordia, I made peace with most of the factions that would let me, mainly in the area surrounding mine, for safe passage of my ships. When moving to progress the game, it was stressed that one of said factions was hostile and needed to be eradicated, forcing me to declare war on them once again and destroy an outpost or be stuck, unable to continue the story. I don't think it necessary to give every game alternate solutions, but allowing the player to end up in that situation is questionable design. This game is fun to play. Flying around in space past planets and through asteroid fields with a fleet I created escorting me was simply awesome. It takes some time to get used to the controls (as there are a great many of them), but once you have a handle on things, the third-person ship flying, which is more or less the main core of the game, becomes satisfying and fun. Moreover, being able to delegate tasks to my ships and hired civilian fleets in real time as I engaged pirates in combat felt good. The strategy elements are incorporated so seamlessly that it never felt like two different games, or two different sections. Being able to assign tasks or handle things personally is a great feature, and more strategy games should have it. Combat is clunky and disorienting, though the latter can ultimately be forgiven by the full three dimension spectrum of movement offered by a ship in space. What mars the experience is ultimately the repetition. For how expansive the galaxy is, I'm not much inclined to explore due to slow travel times. As great as the ability to delegate fleets is, I don't find myself able to do much with that power. The rush of curiosity and motivation eventually gives way to eye rolls as you come across the same type of encounter for the umpteenth time. The silver lining is that the game remains fun all the same, and at the least serves as a good thing to play when looking for a relaxing experience. I'm usually hesitant to award perfect scores, but Starpoint earns it. In third-person, the UI is minimal, allowing one to really take in the views and be as aware as possible in combat. The main feature of third-person mode is the game's context menu. Brought up by pressing middle mouse button, the context menu provides a dynamic array of options for the player, based on what is selected at the moment. Most of the time, this is used to engage the ship's autopilot, but also often used to activate a tractor beam or deploy boarding parties in combat, or to hail ships, stations and planets. The crowning achievement of this game is the Starchart. At the tap of a key, a map is brought up, displaying the whole galaxy divided into a great many hexagonal regions, all tessellated together. Of course, the Starchart is used for navigation, allowing the player to quickly assign a destination that the autopilot will navigate to, but there is far more. The Starchart is the core of the strategy gameplay. Providing quick and easy access to all of the player's stations and fleets, the Starchart is where the management happens. There are many other menus to view outside of it, including the player's perks, research menus, diplomacy summaries and the like, but the Starchart wraps up the heart of the strategy gameplay smoothly and seamlessly, even allowing an option to pause the game while it is open, for those who don't wish for the world to keep moving around them while they micromanage. Starpoint is gorgeous. Perhaps I'm easily impressed when it comes to space, but for how large the map is, it always felt right. Dust clouds, asteroid fields, planets, space stations and more are all lit up beautifully by the star system's twin suns. Even flying around and examining the Concordia impressed me. A nice detail is found when docking on a space station or planet. Despite not being able to disembark and walk around a la Mass Effect, the player is shown an animation of the ship docking in a spaceport that, to my knowledge, is unique to each place. A small detail, perhaps, but it breathes life into the game. The ships themselves felt richly detailed, with many unique and distinct classes, such as destroyer, frigate and cruiser. Each faction has a different style of ship, and it makes each one easily recognizable and adds a layer of depth to the world. The game is a bit graphically intense, and more so if you want to really see the beauty of it. The loading times were very slow, which is somewhat excusable due to the magnitude of the map, but once I was in game, it mostly ran smoothly. Quickly moving across different regions occasionally did cause brief slowdowns as those sections loaded in, but it did not detract significantly from gameplay. Those with mid- to high-end machines should have fewer issues. The sound design in Starpoint is good, but nothing thrilling. It is always a pleasure to see a well voice-acted game, as so many have cardboard characters. The ship's sounds felt right, as did the weapons and destruction sounds. The game's music was good and matched the tone of what was happening at the moment, with decent themes for both quiet exploration/travel and for combat. All around, it was enjoyable but not stellar.